Sunburn is very becoming, but only when it is even - one must be careful not to look like a mixed grill. A cool, metal oxide coating is applied to clear or tinted glass, so that the appearance and performance are the same regardless of glass thickness. Low-e glass brings out the best that technology has to offer for improving your views and comfort! Low-E glass typically costs about 15% more than ordinary glass, but it reduces energy use by as much as 30–50%, by using most of the heat gain in winter but keep the harmful UV rays out during the summer, and when used in insulated glass units - can have even better benefits. For hot climates, low-E coating should be applied to the outside pane of glass. If the windows are designed to provide heat energy in the winter and keep heat inside the house typical of cold climates, the Low-E coating will maximise benefit by being on the inside pane of glass. 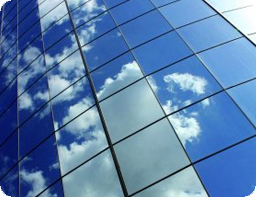 Low-e glass is recommended by many energy efficiency experts as a result of high performance combined with aesthetics. Window glass was revolutionized in the 1970’s. Insulated glass (two or more pieces of glass with an air space between) made its debut in the early 70s. Low E glass was introduced in 1979. The E stands for Emissivity. Low E glass works by reflecting heat back to its source. This is done by utilizing an ultra thin metallic coating on or in the glass. Among other things, sunlight contains visible light, UV light, and infrared (IR) light. Visible light enables us to see things. Ultraviolet light damages your skin, wood, fabrics, leather and causes colors to fade. Infrared light is basically heat. Low E glass has the ability to allow visible light to pass while blocking certain amounts of UV light and IR light. The infrared light in sunlight is powerful – affected objects become hot. These objects can be your tile floors, furniture, sidewalks, patio furniture, etc. As these objects cool off, they emit a low powered form of IR light. Low E glass reflects this form of energy. In the summer this helps to keep your house cooler, as the heat from objects outside is kept outside. In winter, all objects in your home are heated (by either the sun or your heater). This heat is also bounced back into your house by the low E glass. There are two types of low E glass: hard coat and soft coat. Tin is applied directly to the molten glass to make hard coat low E glass. It is hard to scratch the tin off the glass. The soft coat process commonly involves the application of a thin layer of silver while the glass is in a vacuum. Because this type of coating is delicate, soft coat low E glass is always sandwiched with another piece of glass. It can also oxidize if exposed to air. Argon gas is sometimes used to prevent this oxidation.This gas also acts as an additional insulator. Low E glass helps to eliminate condensation on glass. The inside surface temperature of the glass is warmer. The differences can be dramatic. Imagine a cold night with an outside temperature of 0 degrees and a 15 mph wind. The inside temperature of a single pane window would be approximately 26 degrees. Regular double pane glass might register 35 degrees. Hard coat low E glass would be very near 49 degrees. And weighing in at champ would be soft coat low E glass at 62 degrees. Some glass manufacturers have gone even further. They have suspended thin, low E transparent films in between pieces of glass. This system has excellent performance characteristics. Some of these films can block 99.5 percent of UV light. Some boast an insulating value twice that of soft coat low E glass. Low E glass is worth the price, especially since houses can loose 40% percent of the home heating or cooling through windows. That’s why it is worthwhile to purchase the highest quality low-E glass you can afford. Low-E glass filters long-wave radiation from the sun. This reduces solar heat gain from the summer sun, helping to keep your home cooler. Additionally, in the summertime where windows are exposed to direct radi¬ation, Low-E glass blocks unwanted ultraviolet radia¬tion and reflects away the long-wave infrared radiation that can add heat to the inside of your home. Low-E glass takes on a new responsibility in winter months. It lets warm solar rays into your home, while blocking the heat inside of your home from getting out. In cold wether, you spend your energy dollars generating long-wave radiation, as in heat from a fur-nance. That heat moves toward your cooler windows, but Low-E glass act like a mirror, reflecting it back inside to help save you money!